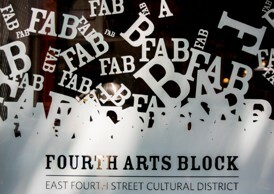 In October our Tuesdays for Good organization is Fourth Arts Block (FABnyc). FABnyc is keeping arts alive now and for the future on the Lower East Side. Saving art in one neighborhood helps all of NYC. Their programs are as diverse as the artist forms they represent. Learn more about Fourth Arts Block here. Shop Exit9 every Tuesday in October and we give 5% of all sales to support FABNYC. This month we are joined by Jimmy’s 43 and Anthony Aiden Opticians in our Tuesdays for Good efforts. Shop with us and Anthony Aiden Optical then eat and drink with Jimmy’s 43. This is our little LES benefit crawl to support FAB NYC.